Last year, Bryant Park FitClub debuted as a way to get a free, high-quality workout before work. The program was a great success through the summer. It was so successful that our Wednesday morning class, Boot Camp with The Rise NYC, was able to continue through the winter with an average attendance of over 30 people each Wednesday morning at 6:30am. This year, we are thrilled to add a barre class to the lineup. Don't like ballet? Not a problem! You might be surprised, but barre3 class has very little to do with dancing. The class is the modern evolution of the barre workout and combines yoga, Pilates, and ballet. Every workout includes an isometric hold, controlled one-inch movements, and functional large range of motion. This three-step sequence is designed to burn fat, build strength, and improve posture. The sequence is taught by the experts from barre3. 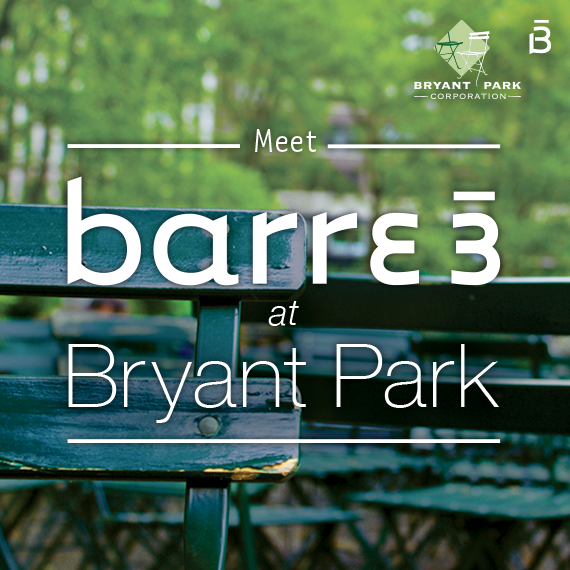 You might be wondering what serves as a barre when class is in the park. We're excited to use the back of our iconic Bryant Park bistro chairs! We are confident that with a great workout and our beloved chairs, you'll have the best Monday mornings of your life. No equipment or registration is necessary; bringing a water bottle is encouraged. Mats are generously donated by Athleta. If needed, a rain call will be made on Sunday night by 10pm. Check the website, Facebook, or Twitter for cancellation information. Join us on Monday mornings at 7:30am for Barre Class. Attend our Monday barre3 class and Wednesday boot camp, and you'll be ready for summer in no time!